I hope you will hang around and listen because I know what I’m talking about. I used to be a dead-broke, single mom who couldn’t figure out how to keep the phone turned on. Now I have great financial security, and I don’t work too hard. A lot of it has to do with content marketing and making smart use of private label rights content. I like to call it brandable content. Brandable content is everything from articles and emails, to small reports, to full-blown courses and workshops that have been developed by subject matter experts. These are people who have a great grasp on content marketing. They’ve developed the content so that you can take it… They are giving you permission, full private label rights, to edit, add to, delete from, brand it in order to give it away or sell it yourself. All I have left to say is to give it a try if you’ve never checked it out before. 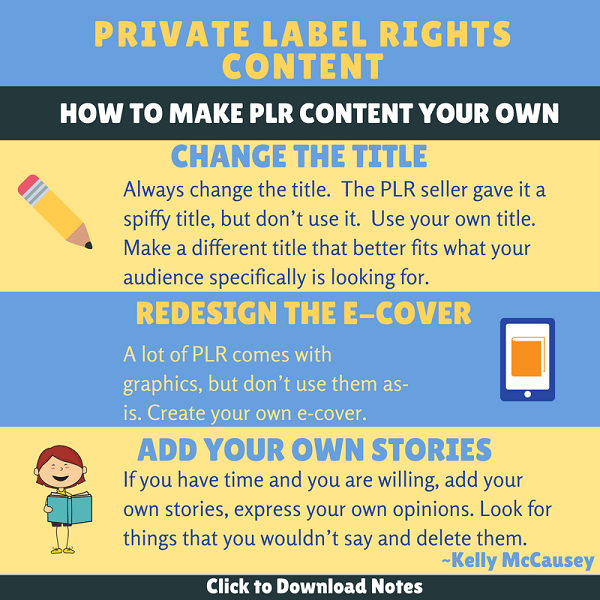 I put together a brandable content bundle, and what I’ve done is provide you with some free PLR for different niches. There’s self-help, business development, and health and wellness. I put it all together, and if you’ll go to RealFastResults.com/plr, you’ll be able to use that to claim some free PLR from several very good PLR providers. You can experience it, see the different formats and styles. You are going to gravitate towards certain providers and be addicted to everything that they offer. That way, you’ll be able to experience it for yourself and see if it’s going to work for you. Great info! I really enjoyed Kelly’s take on the topic. One little peevy point…most PLR says “no refunds!” so getting your money back, if the PLR is sub-par, is a non-starter. thanks guys, all the best! Thanks for your comment. Yes, it is a small point. In fact, you may need to kiss a couple of frogs with the no refund policy. But still it is better than not getting it in the first place. Also, once you find a place that has good quality stuff you almost find something worth using in it. If you DO get PLR that stinks – ask for the refund even if they say they won’t on the website. Give them the clear feedback that their content is bad and stand up for yourself.